Update 5/29/12: Ocean Grill is closing. In a word: Pretty good, but there are other fish in the sea. JM ate the seafood enchiladas with a lemonade. John ate the blackened walleye with a Newcastle Brown Ale. Rose ate the grilled shrimp. We shared the peach cobbler and a white wine cake. The bill was $107, or $26.70/person, plus tip. JM gave Ocean Grill a B+; Nichole gave Ocean Grill a B- (see our grading rubric). Ocean Grill, a Food Fight venture, did a good job of recovering from a shaky start. Here's the thing. After 430+ meals, you'd think we'd know when to call ahead. Not so. On our first try, a Wednesday night, we hadn't, though we did check the slickly-produced web site and were looking forward to a prix fixe deal. When we arrived, we found to our chagrin that the place was reserved for a private party. We had other plans for later Os and that lack of any mention on the web site was the kicker. In a fit of pique, Nichole ran in and asked if we could order anything, anything at all. The bartender demurred, but he did gift us a juice and a lemonade to go. The celestial planes then aligned for us to go and visit it with family on a later night (but still in the correct order) for the full experience. Once we were there, everything was as fine a dinner as one could want. Cucumber-garnished water and adorable sharky cutlery to spread salty butter on warm bread was all a delightful beginning. 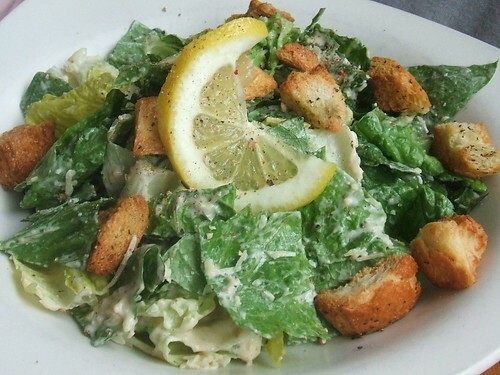 The Caesar salad had an assertive but not overwhelming amount of anchovy. Nichole's wasabi scallops over guacamole proved a safe sort of fusion. The wasabi was not very detectable; the green roe added snap. The bed of silky guacamole with crunchy raw onion had a heavy garlic aftertaste. The blackened walleye came from the mix-and-match fish and sauce portion of the menu, a clever ploy to please the pickier eater. The fish was just OK, according to John. JM's seafood enchiladas were very, very tasty. There were lots of good competing flavors though the seafood tends to get lost in the shuffle. Also, this was a dish that fell apart on any sort of impact, whether from fork or tooth. The asparagus served with the shrimp was the best of the spring, and was cooked just right. The shrimp, while delicious, were not quite ample, though this left room for some of the incredible desserts. One such dessert was this hot peach cobbler served in two separate dishes - an ingenious way to keep the clash of temperatures from disintegrating into a lukewarm puddle. 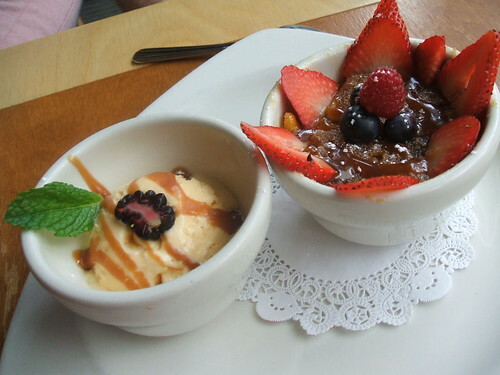 Instead, we enjoyed forkfuls of hot, sweet, not-mushy cobbler to the bottom of the bowl, and cool ice cream in between. Gail Ambrosius chocolates were also on offer at 3 for $9, not a bad deal. 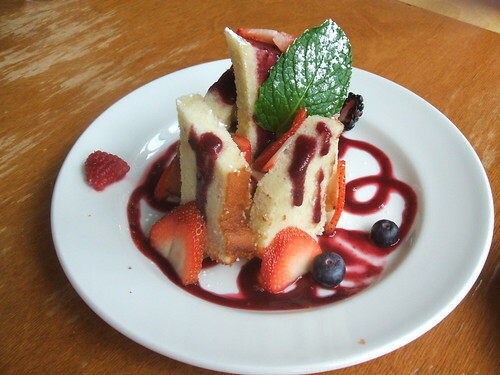 The gateau vin blanc was beautiful - slices of white cake stood on end and dressed up with berries, sauce, mint, and powdered sugar. As we noted before, Ocean Grill has excellent service, marked by the accomodating-within-the-rules bartender and a waitress that put up with more banter than we could ever dish out on our own. While the food was gorgeously styled, like most Food Fight venues, Ocean Grill seemed to lack soul. Upon reflection we can't blame them for hosting parties whenever possible, because it seems to fall into that unfortunate category of too spendy to be a regular meal and not special enough to be a splurge. Their tendency toward the private party precluded a visit for the raw oyster Fringe Foods. I'm starting to be of the mindset that if I leave a restaurant wanting more, it's not the worst thing in the world--so long as I'm wanting more of what I'd just eaten. My one Ocean Grill experience, for Restaurant Week, was really good. Average to underwhelming and extremely overpriced for the quality and preparation of their seafood. I've ended up here a few times but never been impressed, and am always a little shell shocked by the price compared with the enjoyment ratio of my experience. Scallops were way overdone; salmon was bland; a good tuna sandwich at lunch, which is a better bet for a visit than dinner. "Average to underwhelming and extremely overpriced for the quality and preparation of their seafood." Yes. Add the loads of service kinks and you've got serious end-to-end problems. Info about our book Madison Food: A History of Capital Cuisine is here, or read it for free thanks to the library - print & ebook.